This unique gel blend is rich in antioxidants, stimulating and firming botanicals, moisturizing plant oils, and vitamins to balance the skin. It helps lift and tighten sagging or loose skin of the face, neck and décolleté (upper chest area) for greater skin integrity. Excellent for around the eye and lip areas and the hands. It can be used alone or under a DNA CryoStem™ moisturizer and eye crème. 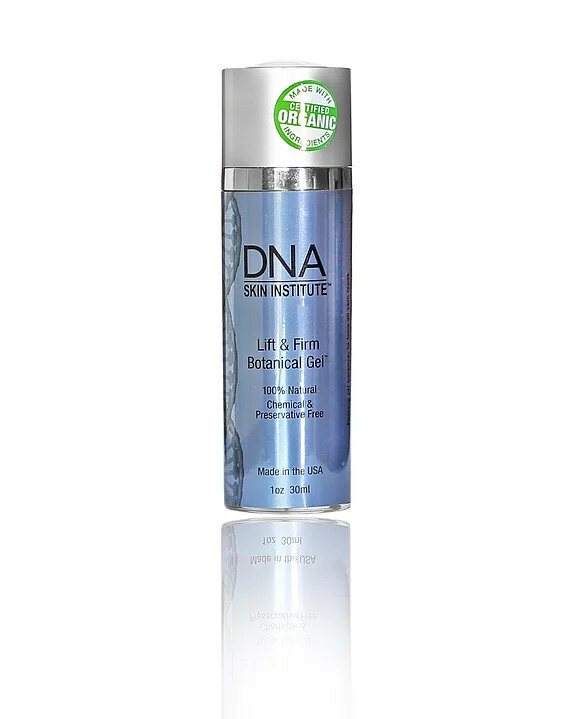 • This is the richest antioxidant formula in the DNA CryoStem™ skin care product line for daily use. • Beneficial for tightening and firming skin laxity of the face, eye area and neck. After thoroughly cleansing and drying the skin, apply Lift & Firm Botanical Gel™ evenly over entire face, neck and décolleté (upper chest area). It can be used around the delicate eye area. Gently pat under eyes and on eyelids and brow bone areas. Use caution not to get in the eyes. Let product absorb into the skin. It can be used alone or under a DNA CryoStem™ moisturizer or eye crème. May also be used on the hands. Steam Distilled Water, Herbal Infusion of Organic Herbs: Echinacea, Alfalfa Leaf, Chamomile, Dandelion Root, Passion Flower; Jojoba Oil, Borage Oil, Witch Hazel, Xanthan Gum, Sunflower Oil, Grapefruit Oil, Lecithin, Lemon Oil, Caprylic Acid, Glycine, Lemongrass Oil, Tocopherol (Natural Vitamin E), Retinyl Palmitate (Vitamin A). The rejuvenating nutrients from tropical sea algae are treasured for their ability to oxygenate and stimulate tired facial cells. Rich in therapeutic minerals, these tropical sea algae have been used for centuries by natives throughout the Pacific Islands to promote a healthy, youthful glow to the skin. Helps remineralize and balance the skin. Skin Type: All. Especially beneficial for oily skin. 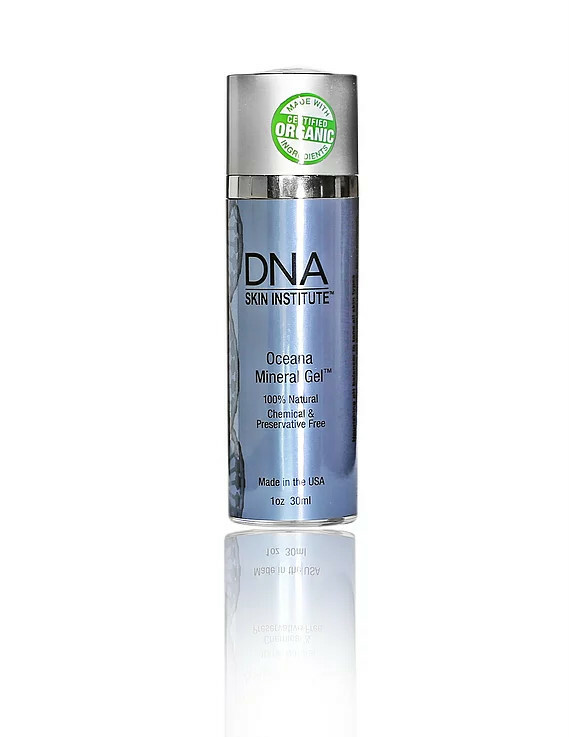 After thoroughly cleansing and drying the skin, apply Oceana Mineral Gel™ evenly over entire face, neck and décolleté (upper chest area). It can be used around the delicate eye area. Gently pat under eyes and on eyelids and brow bone areas. Do not get in the eyes. Allow for product to absorb and dry. It can be used alone or under a DNA CryoStem™ moisturizer and eye cream. Steam Distilled Water, Herbal Infusion of Organic Herbs: Ginseng Root, Milk Thistle Seed, St. John’s Wort; Hawaiian Sea Algae Extract, Aloe Vera, Xanthan Gum, Grapefruit Oil, Lemon Oil.